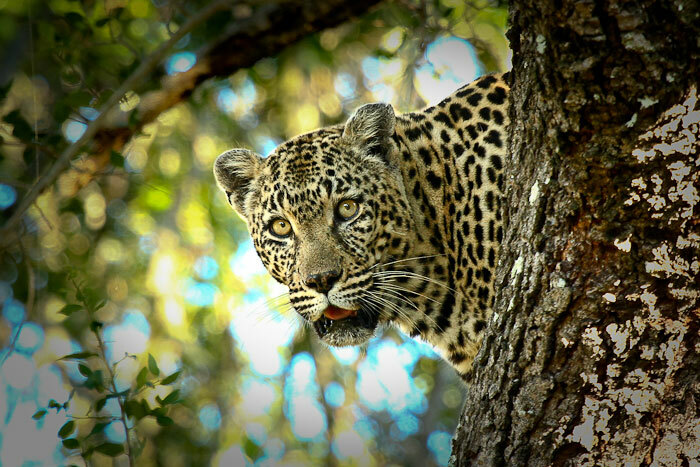 At Londolozi we are incredibly lucky to have been able to view leopards regularly since the late 1970s. This can be attributed to a couple of factors. 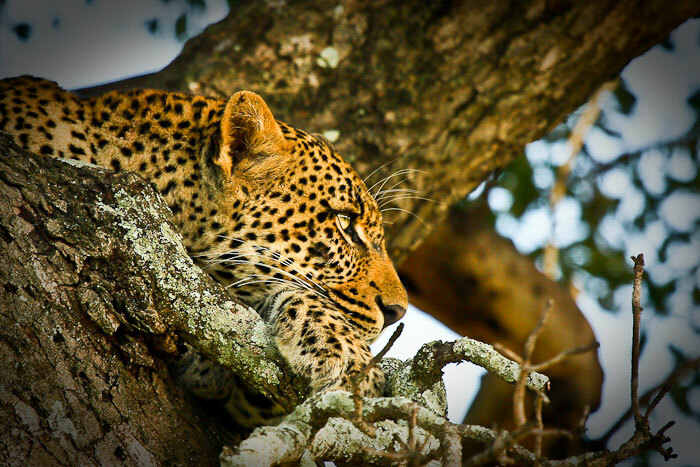 Firstly, Londolozi offers prime leopard habitat as there are many seasonal rivers with the associated riparian vegetation offering good cover as well as potential den sites. 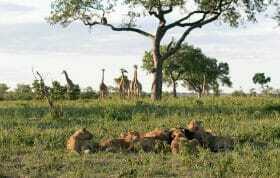 These areas of dense vegetation are interspersed with clearings which abound with general game such as impala, being the major prey species of leopard. Although Londolozi does has a higher leopard density than many other wilderness areas throughout Africa, in truth, most of the credit for our phenomenal leopard viewing should go to the numerous rangers and trackers who, over the years, have put in many hours of hard work tracking these animals, spending time viewing them and documenting their incredible behaviour. 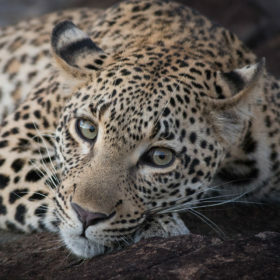 The effect of this is that the Leopards of Londolozi, which are inherently shy and secretive animals, have become relaxed around Land Rovers allowing for unrivaled leopard viewing. 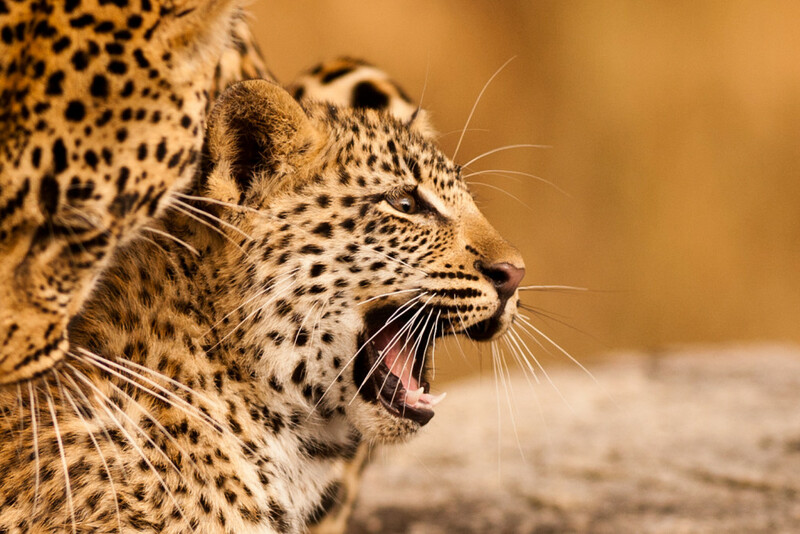 Here the Mashaba 3:3 Female sits with her 3 cubs. 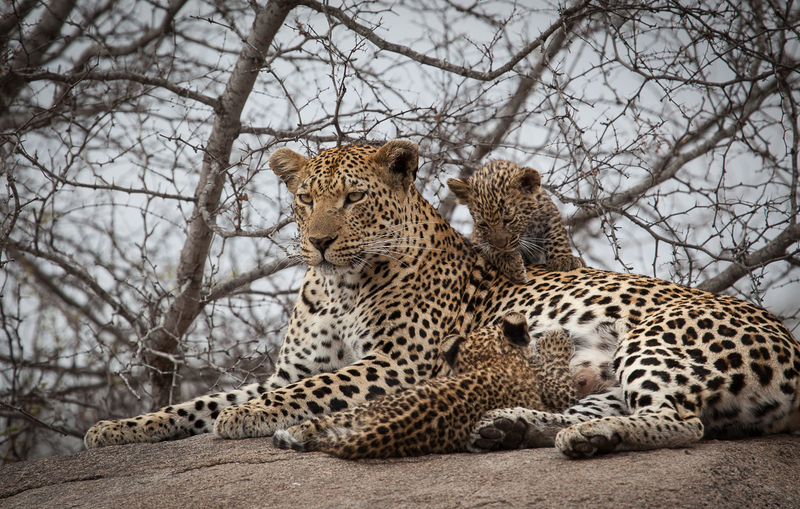 As a consequence of these leopards becoming relaxed, we have been able to, over time, follow the various lineages and document the lives of individual leopards. 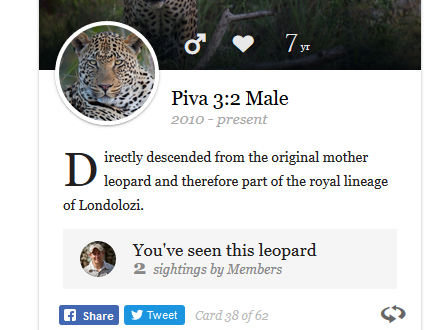 A lot of this information on the individual leopards and their lineages has been aggregated and detailed on the Leopards of Londolozi website. The Nottens female in a seasonal riverbed, known as Schwein donga. This is an area in southern Londolozi where the Mother leopard, the first ‘relaxed’ leopard on Londolozi, was regularly viewed. 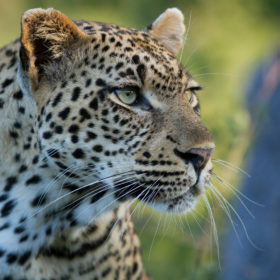 The Nottens female was Londolozi’s oldest leopard at 18 years old. 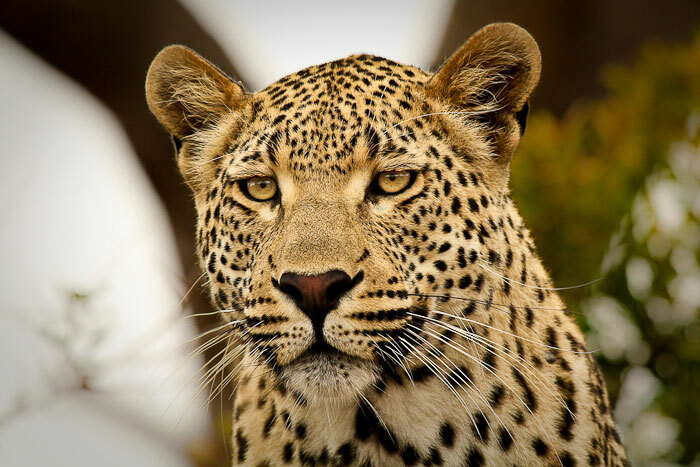 She is the daughter of the world renowned 3:4 Female Leopard. 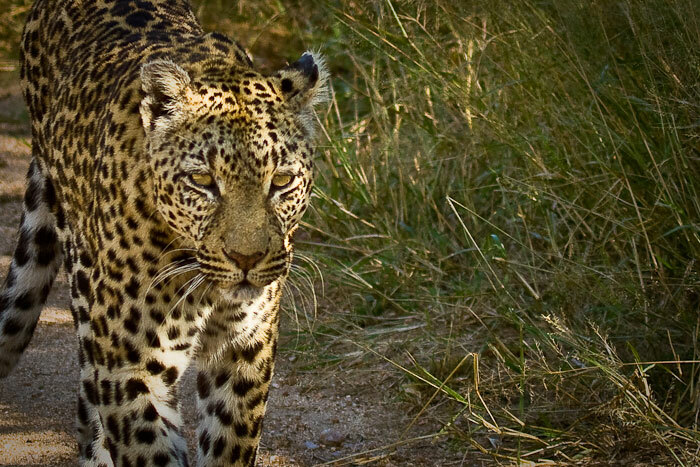 With the regular viewing of these leopards, we have become quite accustomed to identifying individual leopards, but we often forget that this is not so for many of the guests at Londolozi and elsewhere in Africa who are experiencing leopard viewing for the first time. The most accepted means of leopard identification is by using spot patterns. 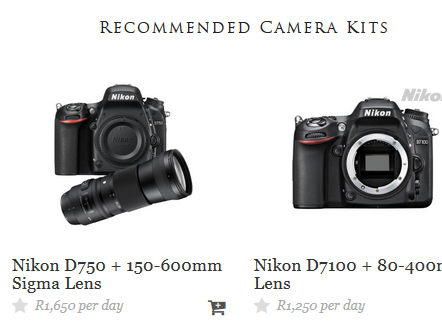 This seems to be quite confusing to people who aren’t familiar with it and rightly so. 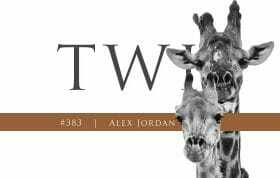 If we refer to the Tu Tones 3:2 young male or the Camp Pan 4:3 male, we are refering to the number of spots on each side of their whiskers. 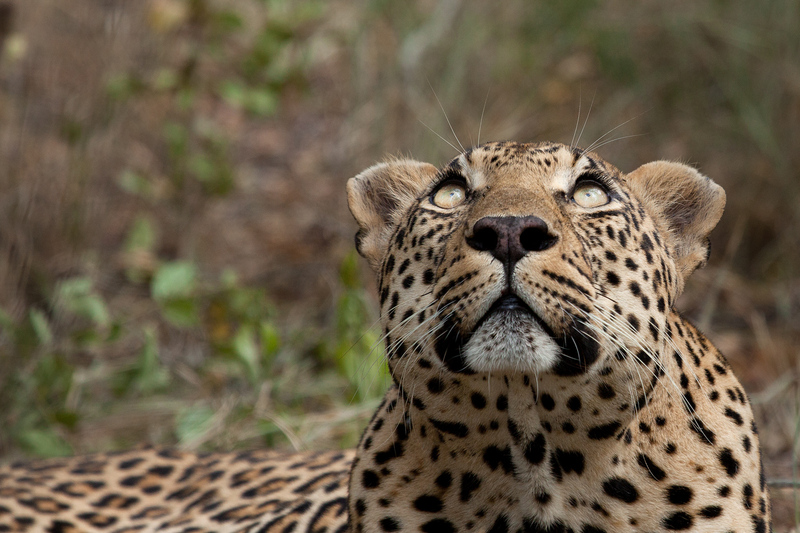 A spot pattern refers to the upper most row of spots on the leopard’s cheeks. 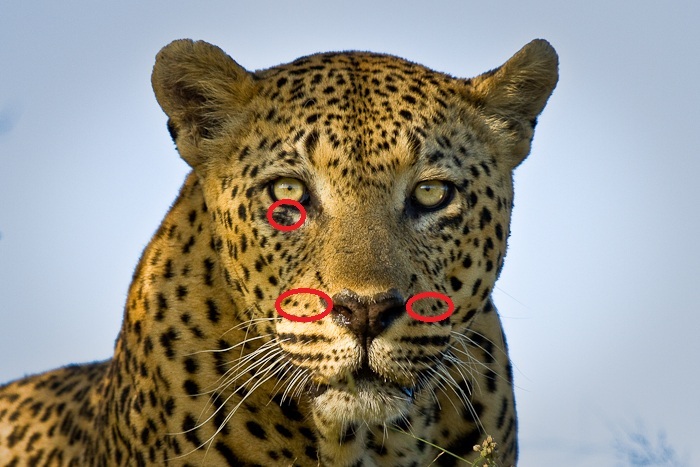 These are the spots above the upper line of whiskers. The spot pattern is made up of the number of spots first on the right cheek and then the left cheek. Using the circled areas, count the upper most row of spots on his right cheek and you will see that there are 4 spots. On the left cheek, you will see that there are 3 spots. He is therefore known as the Camp Pan 4:3 Male. 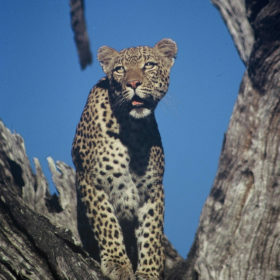 Identifying leopards based on spot patterns isn’t always that easy, as often the leopards are moving or at a distance. 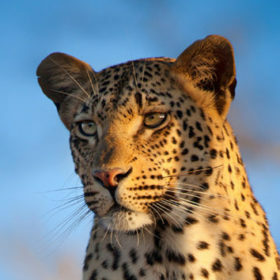 There is also the possibility that there will be a few leopards with the same combination of spots, eg. both the Dudley Riverbank 3:3 Female and the Mashaba 3:3 Female have 3:3 spot patterns. 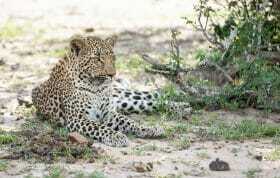 It is therefore much easier if leopards have other features that can be used to identify them. 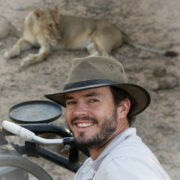 An example of this feature is the scar (black line) under the Camp Pan 4:3 Male’s right eye, which has also been circled in the picture above. 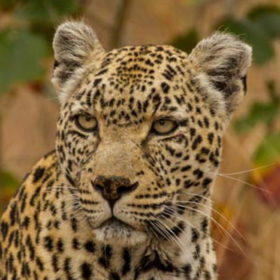 Other examples include the 2 notches in the left ear of the Tamboti 4:3 Female or the simply clear age difference between the Mashaba 3:3 Female and the Dudley Riverbank 3:3 Female. 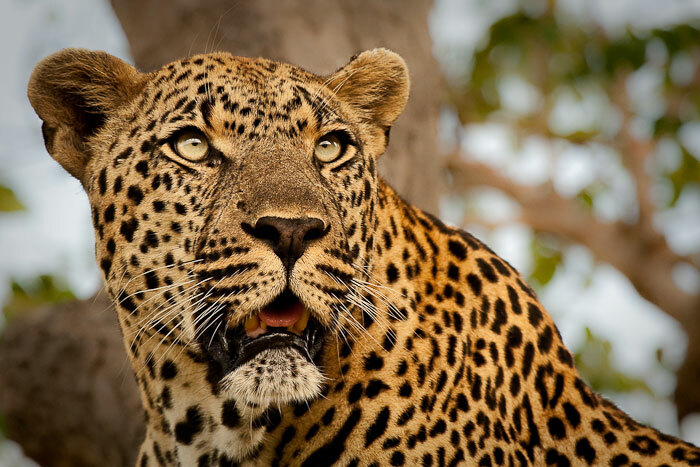 Lastly, as rangers and trackers at Londolozi, we have the added advantage of knowing the territories of the various leopards, therefore if we are driving in a particular area, we are aware of which leopards we are likely to see. 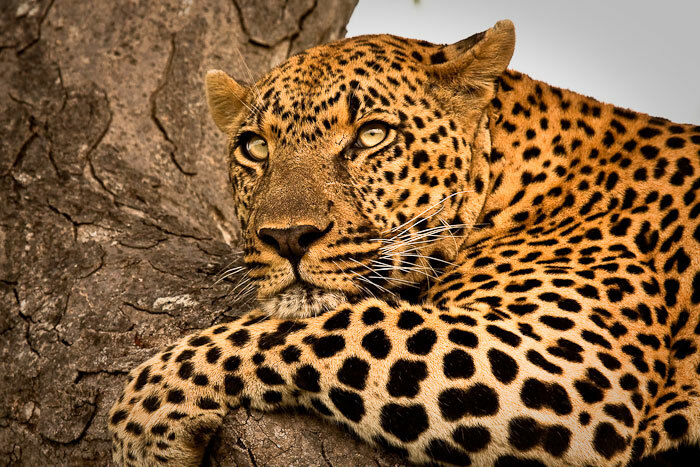 Leopards will seldom, if ever, cross territorial boundaries. The Vomba 3:2 Female’s profile displays over 16 years of territorial movement throughout her life on Londolozi. 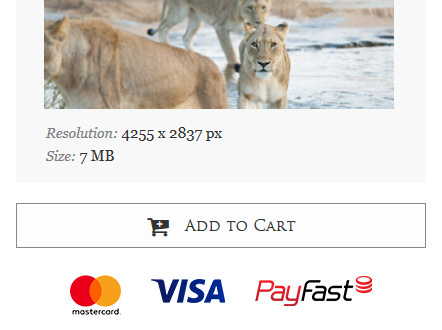 Now that I have explained the process, let’s see if you can identify the spot patterns of the following leopards. 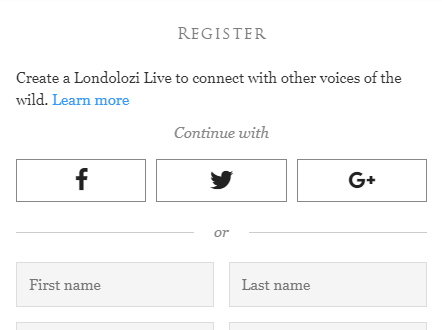 You can search for each leopards profile on the Leopards of Londolozi website. 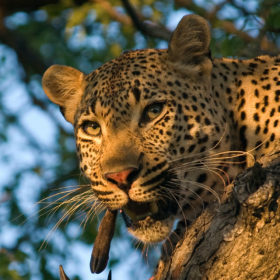 Extra points if you can also give me the name of the leopard :-). 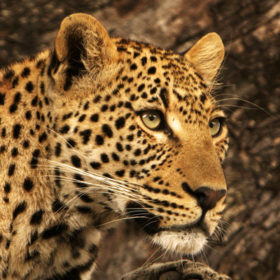 Which of these 7 leopards can you identify? I can’t wait to see everyone’s answers. Keep following this post to see if you got them right. 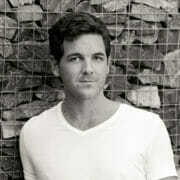 About your question.. I`ll try my luck. Well done Rudolf, a 100% strike rate. I think we can safely say that you have passed leopard ID 101 with distinction! 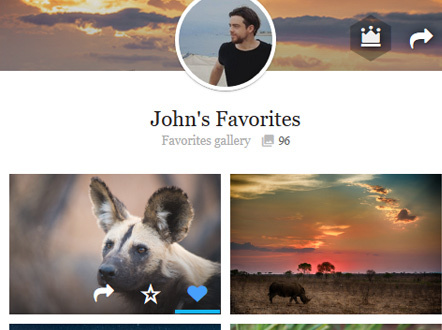 Thank you again for this beautiful Blog and the photos! 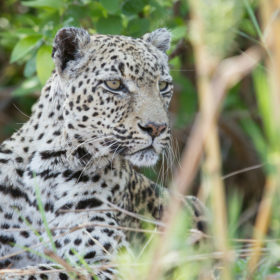 If you count carefully Annemarie, you will see that the first leopard is 5:4, therefore the Tugwaan male (aka Short tail male). Your spot pattern count for the second was correct (3:3), but it is actually the Maxabene young male. Look at the triangle spot pattern on his right cheek, I find this very distinctive. Nyeleti male was correct. The last was actually the Dudley riverbank female (3:3). Although Nottens is older, Dudley riverbank looks the oldest of our leopards and is very grey! Good try! 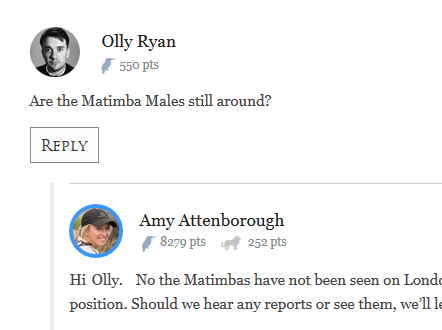 Hi James, Thanks for answering and correcting. 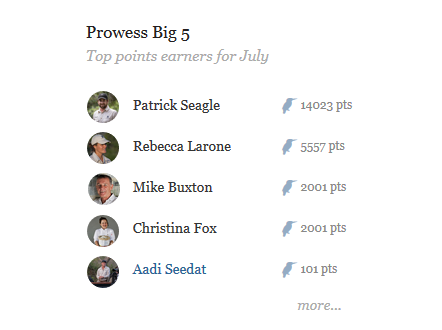 Now that I check again, I can see where I was wrong, but to recognize them is very difficult. 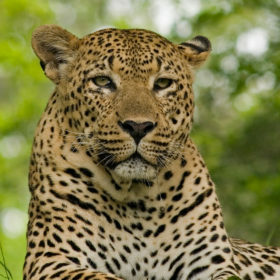 As I said, I was just guessing and have never seen leopards in the wild, although I visited the Masai Mara in Kenya twice. second pic is bicycle crossing/ short tale male? Right James, my next drive is with you! Once again a fabulous read and incredible pictures. 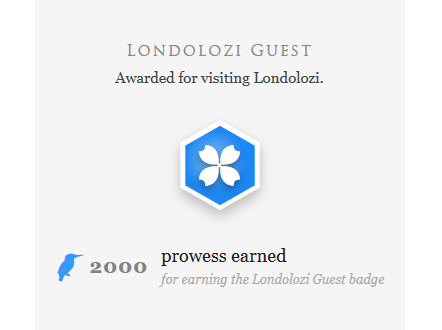 I have no idea about the identities but I definitely chose to stay at Londolozi because of the leopards. 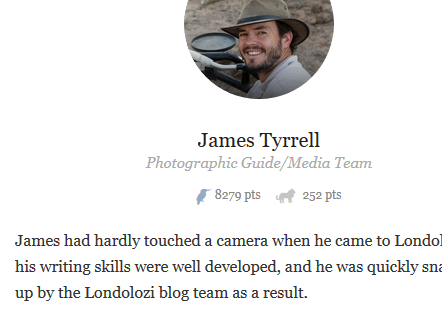 Great article James. Thanks Sandy. Thats the same reason I chose to work here! Your favorite male is the 5:4 Short Tail male. Young male is the 5:5 Dudley Riverband male. I think blue eyes is the 2:3 Nyeleti Male. Last is the Dudley River 3:3 female. Kiki, you got them all right except for the second one. 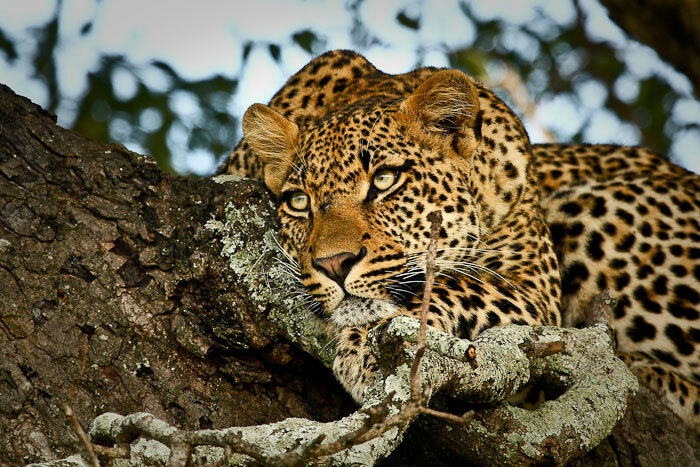 He is the Maxabeni 3:3 young male. Look at the distinctive triangle spot pattern. Good effort Mary Beth! 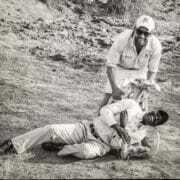 You just got the wrong Maxabeni young male, it is his twin brother, the 3:3 young male. Note the brown nose as well as the triangle spot pattern. The 3:2 young male has more of a pink nose. The last one is the Dudley riverbank female (3:3) as opposed to the 5:5 Nottens female. Both are very old leopards, so that was a good guess. I think Rudolf has all the right answers. The first is Short tale 5:4 i strong belive.